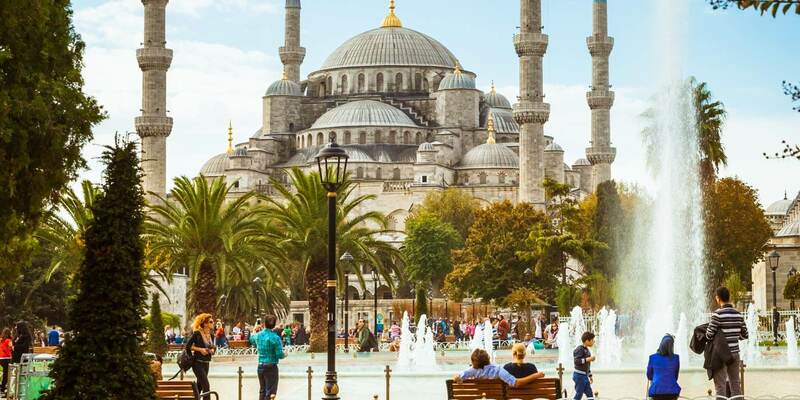 Explore Turkey as you journey to the modern-day land of the ancient Ottoman Empire, rich in cultural influences from times past. Visit the remnants of an ancient Roman spa city at Hierapolis; soak in the nearby mineral-rich thermal spas at Pamukkale; indulge in the luxury of authentic Turkish delight and Turkish baths; shop at the sprawling Grand Bazaar, one of the world’s oldest covered markets; or pay homage to the Greek Gods of old at the Temple of Apollo. Turkey has many sites of historical importance, having once been the ancient capital of the Byzantine Empire. Visit Hadrian’s Gate in Antalya or stop by the Temple of Apollo in Didyma. Relax with a Turkish bath in Istanbul or go white water rafting along the Zamanti River. Well known Turkish dishes include shish kebab, köfte and lokum, better known as Turkish delight. Many of the dishes in Turkey have a lot of Mediterranean and Middle Eastern flavour to them. Lamb is one of the main meats present in Turkish cuisine, which is usually known for being big on meat. Don’t forget to indulge in a glass of Raki, the national beverage of Turkey.